Travelers find a perfect place to relax. Locals serve travelers. The word spreads and more travelers come. Locals fill the beaches and nature with hotels, nightclubs and fast food restaurants. Travelers think the place is ruined and look for another place to relax. Does the cycle sound familiar? When Western hippies found the Indian state of Goa in the 1960s, the place wasn’t very commercialized. While Goa still has the reputation of a perfect getaway and it’s extremely popular with young travelers, the state has became a much more touristy destination than it once was, with more and more services tailored for backpackers. 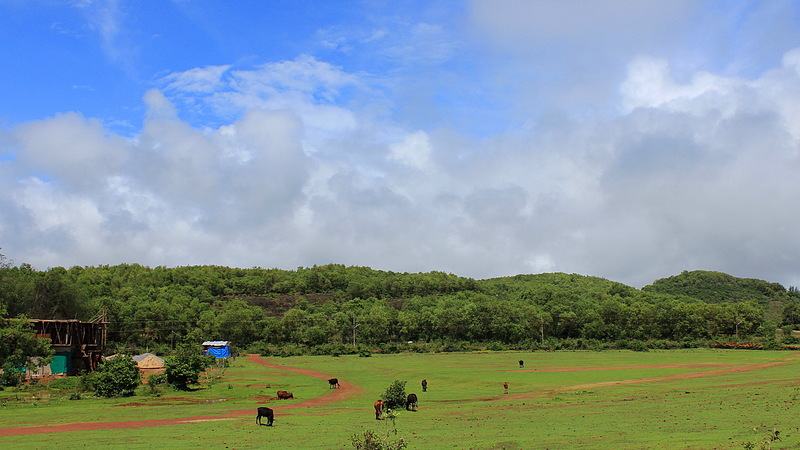 Gokarna is still surrounded by empty fields, but construction sites for new hotels were a very common sight. Personally, I’m not a fan of the way some backpackers consider themselves the “true” travelers and despise “commercial” tourists. Hey, the tourists want to see different places just like you do, so there’s no reason to be disrespectful! To me, everyone who visits a country and doesn’t live or work there for a longer period is some sort of a tourist. I am a backpacker, but I am also a tourist. 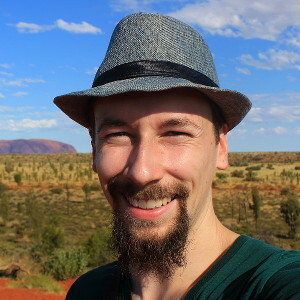 When I go to a new country, I’m a tourist there – it doesn’t matter how long my trip takes in total or how many countries I’ve visited in a row. The view down to Gokarna Beach from Zostel Gokarna. Why the long prologue about the development of tourist destinations? Well, the whole process came to my mind when I found Gokarna, a small town less than a hundred kilometers south from Goa. The beaches of Gokarna are filled with guesthouses and the small town is a pilgrimage site for Hindus, but Gokarna is still a relatively quiet town, especially during the off-season. For me, Gokarna is not just a quickly developing tourist destination. It also became one of my favourite places in the universe. What made Gokarna so special for me? The first thing that sold it for me were the views. My hostel in Gokarna, the recently opened Zostel Gokarna, is located on a hill just a short distance away from the town. 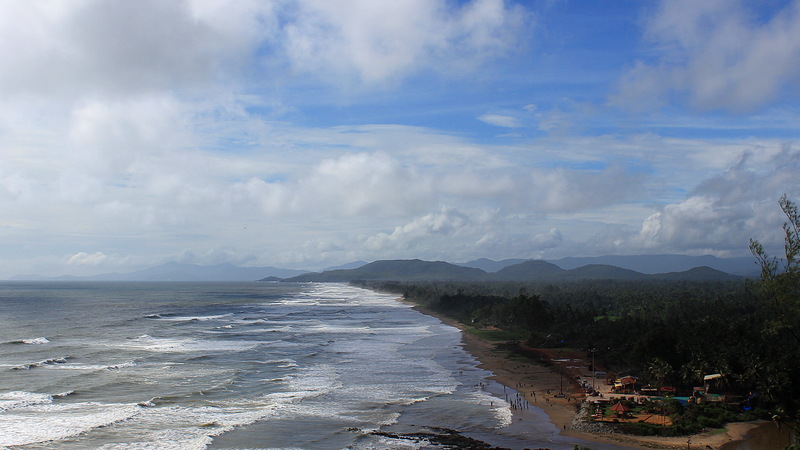 The hilltop hostel offers a perfect view down to Gokarna beach and the long coastline. And although the town is nearby, it’s almost impossible to spot the buildings under the tall tops of palm trees. The view is just stunning. Hostel guests could eat their meals and enjoy the view at the same time. 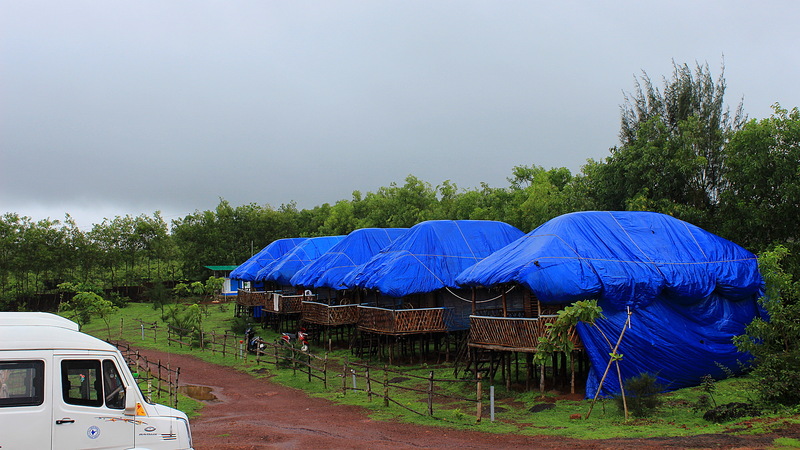 Because of the monsoon season, the huts were covered with tarps. Luckily, the weather was surprisingly good during my stay. Besides the scenery and the nature, the people were also amazing. The manager of Zostel Gokarna, Pradeep, was one of the friendliest and most sincere accommodation workers I’ve ever known. A fellow traveler, he was genuinely interested in his guests’ adventures and went to great lenghts to make sure the visitors felt comfortable. As an amusing sidenote, I have to mention that English wasn’t the only language me and Pradeep shared. He had lived in Sweden for two years and I had to study Swedish for five years in school, so we had some simple conversations in that language as well. And while my vocabulary might have been a bit broader, Pradeep spoke Swedish more fluently than I do! The other workers at the hostel were also very friendly and I enjoyed the time I got to spend with other backpackers. I had originally planned stay in Gokarna for just two nights, but I loved the place so much that I decided to stay an extra day in Zostel Gokarna. 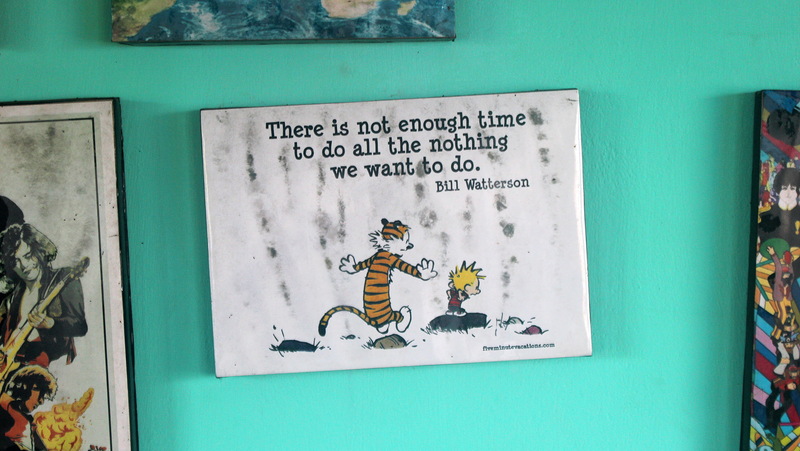 A Calvin & Hobbes print at the wall of the hostel’s common room. And what can you do while backpacking in Gokarna, one might ask. Well, that might be the best part: absolutely nothing! But there are so many ways to do nothing there! You can do nothing at one of the beautiful beaches, or you can just stay at your hostel and chill out. Or if you want to put an active spin to your relaxation, you an go for an aimless walk at the stunningly gorgeous cliffs by the seaside. 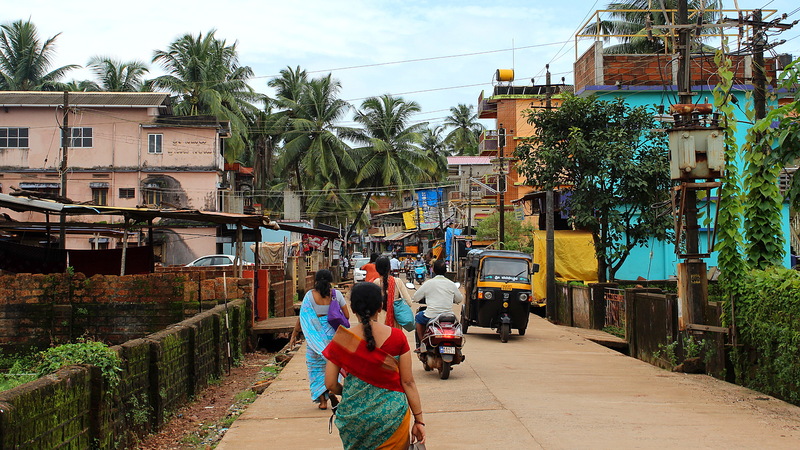 During my first full day in Gokarna, I went for a lengthy walk around the beaches of the town. The first beach I walked through, Kudle Beach, was quite dead during the off-season. Most of the beach huts were closed and there was garbage on the sand, but it was still a nice stroll. 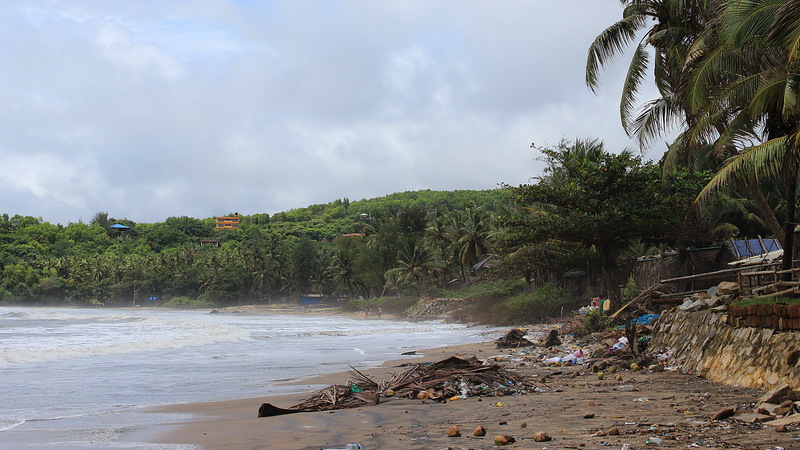 Kudle Beach might be kept cleaner during the tourist season, but now it had plenty of trash laying around. During the walk, I faced many situations where the only way to move forward was by crossing knee deep streams by the sea. Because the temperature was so warm, getting wet wasn’t an issue. The people and the flowing water shared the same routes to the sea. In Finland, you want to keep yourself dry if it’s raining, because you fear catching a cold. So you wear rainproof clothes, pack an umbrella and complain about yet another ruined Finnish summer. In India, the rain is seen in a more positive light. Heavy rain during the Monsoon season means more water for plants and lower prices in grocery stores, so a dry Monsoon is actually a bad thing. 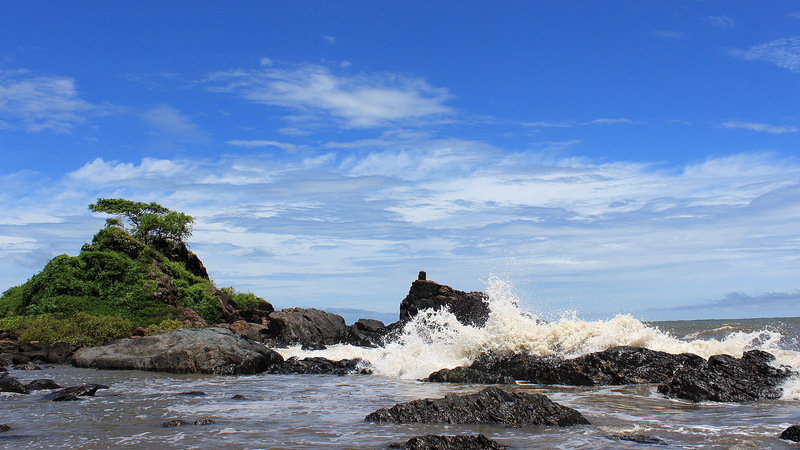 While the Monsoon season is not the best time to go backpacking in Gokarna, it will not ruin your stay. 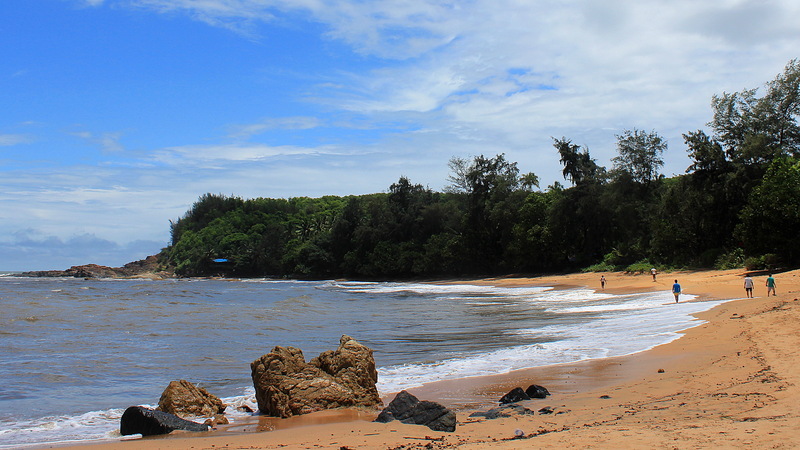 The final beach that I reached during my hike was Om Beach, which often listed as one of best beaches in India. And yes, it was gorgeous! 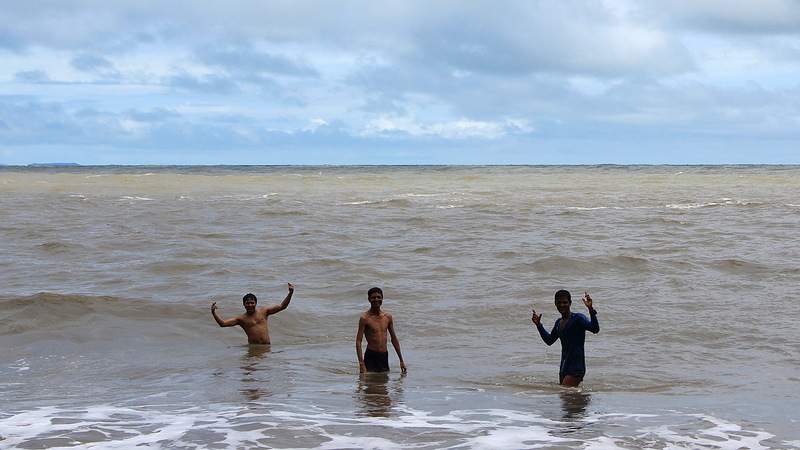 After walking around for a while, a group of local guys invited me to go for a swim with them. It was good, mindless fun to just jump against the high waves over and over again. Nandish (on the left) invited me for a swim with his friends. Okay, enough about the beach already! Here’s a picture of a dog. The best travel moments are often those that just happen spontaneously without planning or a forewarning. This felt very true during my last full day in Gokarna. Gokarna is one of the main pilgrimage sites for Hindus, In Hindu mythology, Lord Shiva emerged from an ear of a cow here. I didn’t plan to do much, but I went for a short walk in the town and then another one to the cliffs near our hostel. I had already visited the cliffs the previous day, but I enjoyed the place so much that I decided to visit it again. 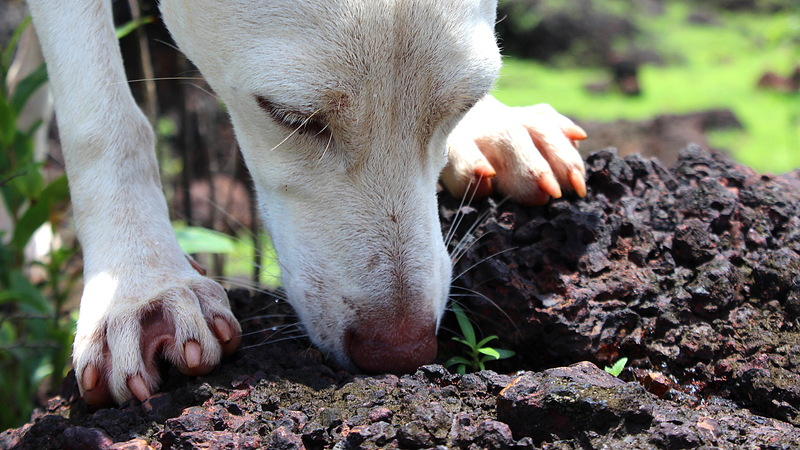 When I was approaching the cliffs, I was joined by a white dog. At first, I didn’t notice the dog approaching behind me, so I nearly kicked it with my heel accidentally when it came to sniff my legs. After spotting the tail-wagger, I decided that I’d let the dog join me for my walk. I slowed my pace and chose routes where the dog could follow me easily. When we reached the top of the cliffs by the sea, I sat down and noticed how thirsty the dog seemed. The sun was blazing from the sky, so I gave the rest of my water to the dog. I emptied my water bottle on a concave rock where the dog could drink it easily. When my bottle was empty, I thought I’d find us a shade where we could rest for a while. My search was fruitless, but then the pooch found a spot that I had not noticed. We sat down under a bush for a while and I just enjoyed being in the moment. After sitting down for a while, I saw a small religious statue facing at us on the rocks. The slower you go, the more you see, it seems! Saying goodbye to the dog was difficult, because… well, I don’t speak Dog and I’ve got no idea how to tell one that you’re leaving. I hoped he would stop following me at some point during my long walk back to the hostel. Instead, it came with me all the way to the gate of the hostel, where I had to close the gate between us to keep my newfound friend outside. A sad farewell indeed. 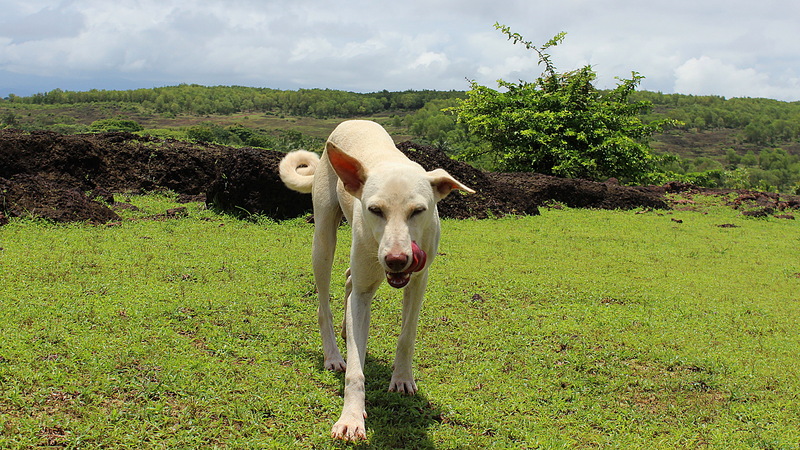 Leaving the dog behind was hard, and so was leaving Gokarna. The place felt like a paradise where I could have stayed for days and days. But that wasn’t an option now, because I had to be in Delhi to meet a friend in less than two weeks. Thus, I continued my backpacking journey north. Love Gokarna! 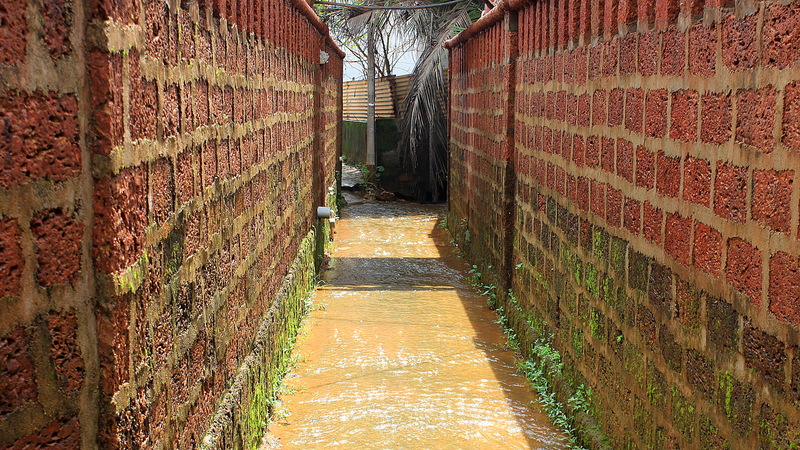 Kudle was really clean when I visited in 2014. What month did you visit the town? I think someone told me that the locals start picking up the trash when the tourist season begins. Most of the beach huts are closed during the Monsoon, so Kudle Beach was very quiet. The amount of trash was far from the worst I’ve seen, but it was still noticeable. This April,visited Morjim beach in Goa and again very few people! Loved it! Sounds like great experiences! 🙂 It’s always the best timing when the weather is good but the place is not too crowded. Great pictures.. it is sad that tourists litter the beaches thoughtlessly.. would love to stay at this hostel! Thank you! 🙂 I guess some of the trash are lifted to the beach by the tides of the ocean, but littering is also a real problem here. Great blog! Really liked the posts! I too have been this place.Ya its a excellent as u described .I could recall all the all the experience while going through ur blog. Nice Blog.Interesting.Check out Kinara stay. 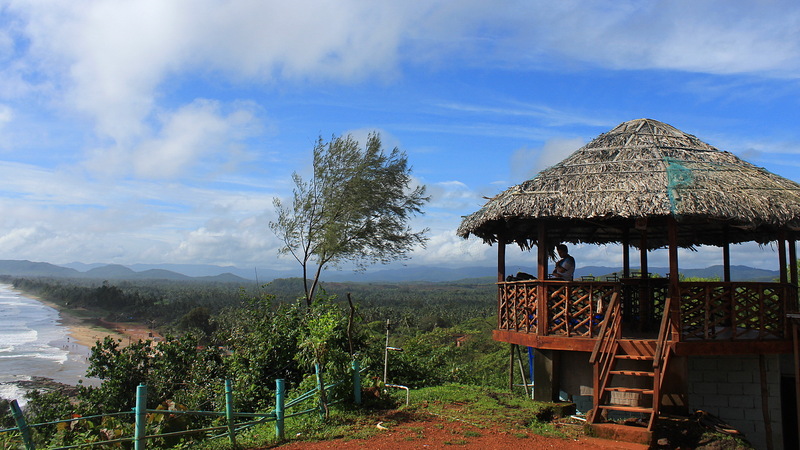 It’s a Lodges Near Gokarna. Offers excellent services to guests. Yes, I agree with you. I stayed in Kinara. They offered excellent services to me.